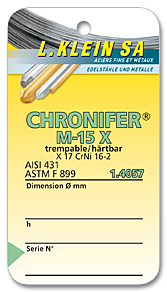 The hardenable stainless CHRONIFER M-15 X (431 (X) is produced by a special powder metallurgic technology. This technique allows a significant improvement of the properties of the steel. 431 (X) has a very fine microstructure and homogeneity, resulting in good processability, wear resistance and excellent polishing and corrosion resistance. With this outstanding characteristics of CHRONIFER M-15X, the rejection rate in the production of finished parts is reduced, thus the needed material for the production is also lower. M-15 X meets the high quality requirements that are imposed on instruments in the medical and in the dental industry. Its excellent hardenability, ductility and corrosion resistance ensures the manufacturing of precise, wear-resistant parts for this sector. In medical engineering the steel is used for the production of gear parts, rotating instruments, surgical instruments like pliers, pincers or scissors, in the dental industry drills, gear parts for rotating instruments and more are manufactured from this material.